On April 24th, 2013, the 8-story Rana Plaza building in Bangladesh, where clothes for labels such as C&A, Primark and Benneton were produced, collapsed. In less than 90 seconds 1.134 people were killed and 2.500 were injured. Today it is five years ago since the Rana Plaza disaster. It is also five years ago since Fashion Revolution was born, the movement that tries to change this incredible dirty industry. Because that is what fashion is. And that is what needs to change. Rather than making us feel guilty – when I do research for this blog, I sometimes feel like the only option I have left is to become a nudist – Fashion Revolution strives to show that we as consumers DO have the power to make a positive change. I composed a list of 6 of my favorite ways how you can make your wardrobe ecohappier. I decided not to buy any clothes for an entire year. If that’s too cold turkey and radical for you, why don’t you try it for 6 months, 3 months, maybe even one month? Every item you buy less, has a positive impact. It takes on average 6000 liters of water to produce one single pair of jeans. That is enough for 1 person to drink for more than 8 years. Note: it’s difficult to calculate an exact number, different sources quote estimations ranging from 3.700 to 20.000. That is why I used an average. Allright, so you did take a good look at your wardrobe and you decided that you really need (or want) a summer dress. Or a blazer for that new job. And you are going to wear it at least 30 times. Instead of heading over to the shopping mall to buy the newest of the newest, or instead of clicking your way through the endless amount of pages with new clothes online, give secondhand shopping a try. If 1 million women women bought their next item of clothing secondhand instead of new, we would save 6 million kg of carbon pollution from entering the atmosphere. There are several online initiatives, such as Poshmark (available in the United States only), ASOS Marketplace or United Wardrobe, but you can also check out vintage shops in your hometown (if they exist of course). Fast fashion is focused on speed and low cost, so each week there are new collections in store at a price as low as €4 for a t-shirt. And although it is tempting to wear something new every time you go out, both the environmental cost and the human cost of fast fashion are incredibly high. Textile dyeing is the second largest polluter of clean water globally, polyester garment pieces are shedding microfibres into the ocean each time you wash them, toxic chemicals are used in agriculture to meet the growing demand for cotton and last but not least the human cost of underpaid, overworked, mistreated garment workers. There are an estimated 40 million garment workers worldwide, the majority of the earning less than 3 dollars a day. Fast fashion is not cheap. Something or someone else is paying the price. Each time you spend money, you have a choice. On sites such as Rank a Brand you get insights into how sustainable your favorite brands are and initiatives such as #whomademyclothes encourage brands to become more transparent. If you are like me, a.k.a. NOT a fashionista, you might find yourself more than once in front of your wardrobe, full of clothes with just one thought: “I don’t have anything to wear”. There is a good chance that is not because you don’t have any pants or shirts or skirts, it is probably just because you don’t own the right pieces. According to stylist Wendy Mak, you actually need only 30 pieces of clothing to create a wardrobe. Her ideas fit the trend of the “Capsule Wardrobe”, where you create many different outfits with a limited amount of clothing items. To how many items you can limit your wardrobe obviously depends on different factors. I have a friend living in Aruba, which means flip flops all year long and no need for a winter wardrobe, other people are required to wear a uniform to work, but the idea of downsizing your wardrobe and still be able to create so many different looks is a great initiative! 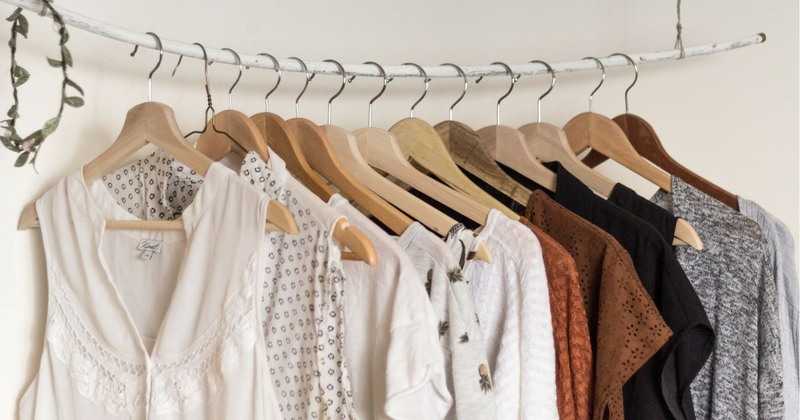 Interested in Capsule Wardrobes? Take the Project 333 challenge, just like I did! “Who are you wearing?” might be one of the most asked questions to Hollywood stars on the red carpet. Fact is, the clothes they wear are often not bought. Ok, yes, they get a lot of stuff for free, but it is no secret that in the world of glamour it is completly normal to rent clothes. And why not? I love the upcoming trend of clothing libraries (such as this one in my home town), where you no longer own your entire wardrobe, but rent clothes. Did you know you can even lease jeans? One persons trash is another persons treasure. That definitely goes for fashion too. That dress that has been in your wardrobe for years, but you never used it. Those pants that no longer fit after losing a couple of kilos. They are just taking up space at your place, but they might be perfect for someone else. Hosting a clothing swap is fun and easy. The blog “Hey, let’s make stuff” has some useful tips when you want to organize one.